FBW falling block. Nice cases by RMC.Shotgun primer. factory loads work in the gun also. 900gr for 10. More accurate in smooth bores. expensive doubles and O/U. And nice shaped pistol grip stock. They have the nice stylish look like the Win 37 and Stevens 94. But they are heavier built, just need heavy barrel. and one my 585 HE like I did in the NEF.And they are 50 to 100 bucks. like NEF 10/12 gauges. The bearing surfaces on the pivot is .300"
wider, and pivot block is 1/4" wider. Pivot pin is 1/10" bigger. The action is a 1/2 inch taller, and extra diameter at breach end. with recoil. And in a break action looks better to me. which is low cost and put extra toward the barrel. 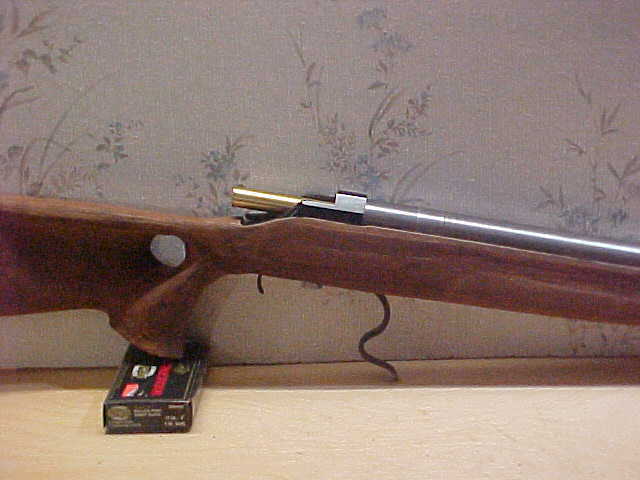 as it is about perfect for the 20ga added heavy barrel. Or in NEF, a little more. Or other singles, if heavy enough. get great velocities, less cost.. Like 600gr to 2200 or more. made with deep hollowbase, 10ga 900gr, 8ga 1100gr. He will make them for a buck each. Good price as they are nice hard shiny slugs. will do better, about a 100 fps in the faster loads. Plastic seals for 10 ga are at BPI, called - X10X. will make the overall projectile more front heavy. better streamlining.Fullbore and no sabots needed. 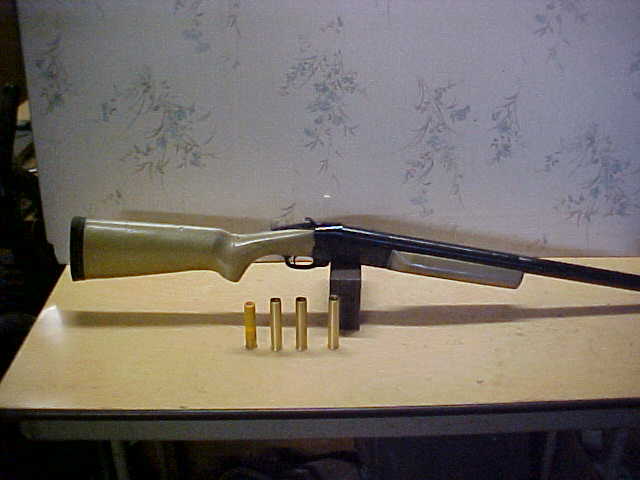 Looks like a really neat shotgun/rifle "because you can".... but in reality, what would it be used for? What kind of hunting? Buffalo? Elephant? Grizzly? that in the reloading process we can get more power also. with the slug glued in and wad cut off even with top of slug. Then with wad cut even, you load and can rollcrimp perfect. in smoothbores, as the expensive 10ga foster style slugs. using Goop, a thick glue that hardwares sell. Epoxy works. factory for smoothbores, and be as accurate as foster slugs. And our slow powder loads seal good with wadcups. accurate US-S smoothbore locked on base slug, that is long. The longer the nose heavy slug/sabot combo is, the truer it flies. wood blocks up to 12" through. 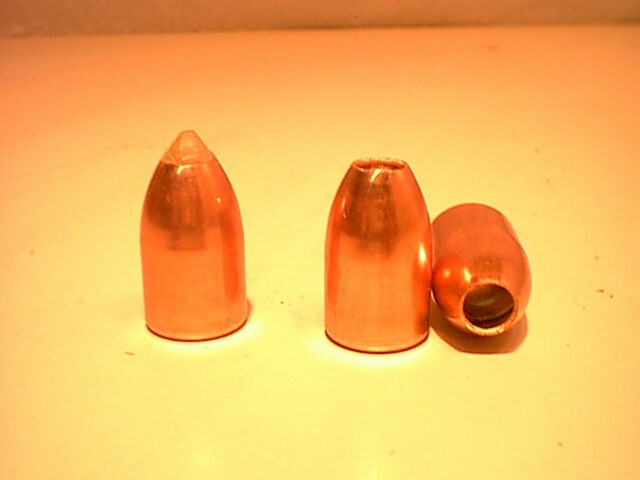 20ga load is a 54 cal 410 gr slug glued in wadcup. Gives the same effect as Brenekke with locked on base..
all zip through 3/4" OSB and keep going. In 4bore 760gr steel ball zips through 12" block of wood. going over 3200 fps. Wood is dried hard poplar. on a screwed on base with plastic seal and wad. 12ga 600gr hard slug at 2100 zips through 12"
slug in this at 2800 in Enfield test gun. speed to it. About 33-3400.
into the 12ga barrel setup on the CBC break action. built like the 4 bore one.Maybe done by summer. without starter powder. We found RE-17 and surplus 7383. 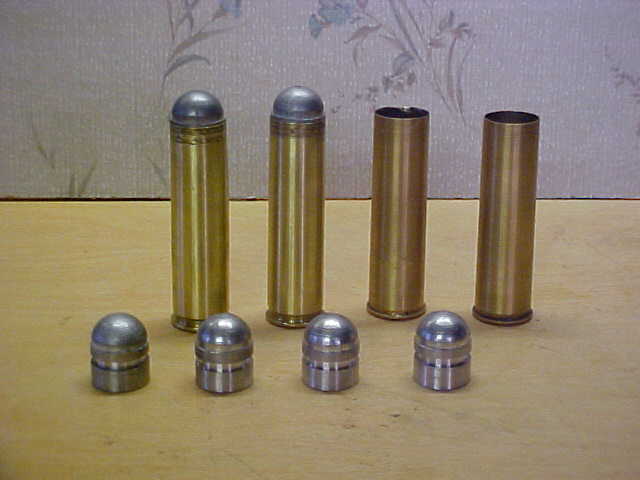 To recap faster rifle powders we use -VV110,IMR 4759,4227..
inch brass cases. And 3.5 " plastic cases. 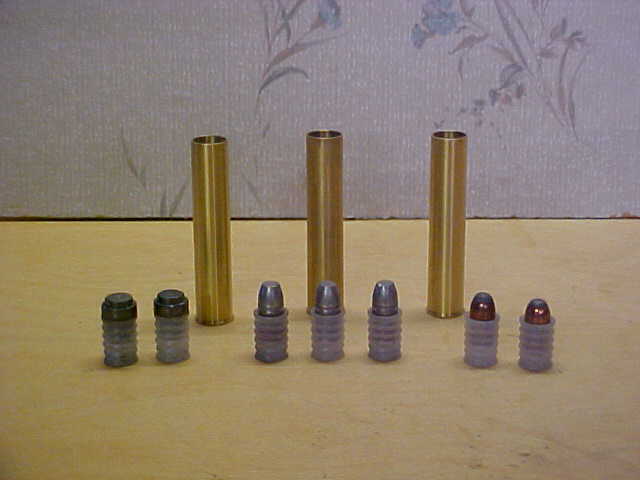 860-1040 gr slugs. Tested in NEF with long heavy barrel. We finally got some RE-50,a really slow powder like H-BMG. easier, to get the initial combustion started. and 220gr with 1040gr slug, 1750. In 3.5" plastic 860gr slug with 180gr RE-50, 1500 plus. slow, but cases don't expand, not even plastic case base cup. or cases expanding to stick. primers and used in other plastic and the brass cases. Some guys trying to free up 239 primers for us reloaders. 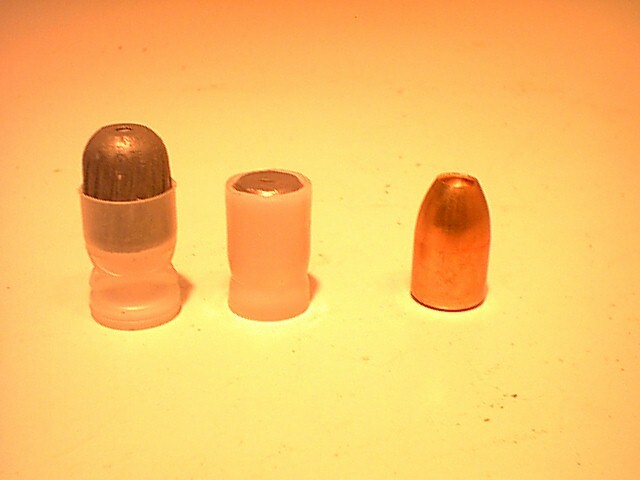 Federal puts them in 3.5" mag 12ga loads and 10ga cases. Elsewhere it was reported someone may do a 16ga sabot. Well it's not my cup of tea but I applaude your creativity and passion for this megga bore project. for a lot of my experimenting. I use a short 24"barrel 10ga. The barrel being shorter I can see the sparks and flame. I fire off the primers in case with no powder/slugs. inline muzzleloading primers were as strong as FED 239. Let me know how much and where to send it. These would awesome conversation pieces to add to my collection!!! as the regular barrel on the gun had a thin muzzle. a BPGS and Flexseal over powder..
is the bottom part from 16ga wad cups. is 20ga 3.5" plastic and brass cases. 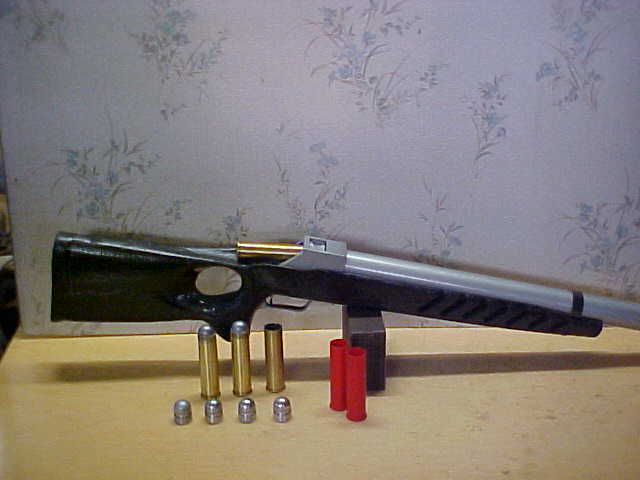 change barrel for 700HE long case for this action. Imagine over 20,000 ft lbs in a PH, for 700HE. 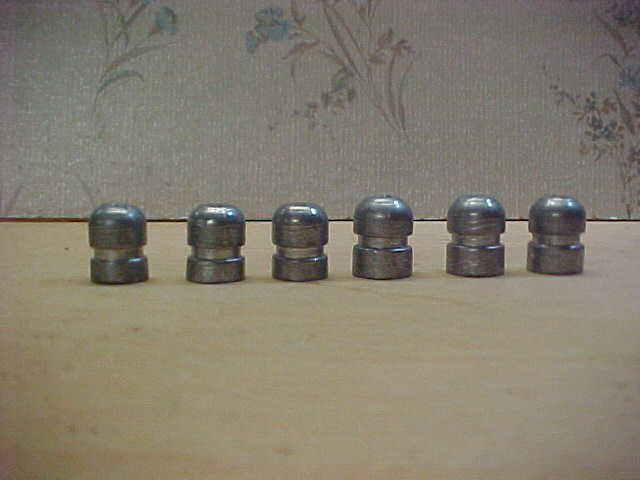 Here are some 20ga slugs/sabots we rigged up. back in so base stays for fair smoothbore accuracy. shooting as I have pile of hard lead 458 slugs. 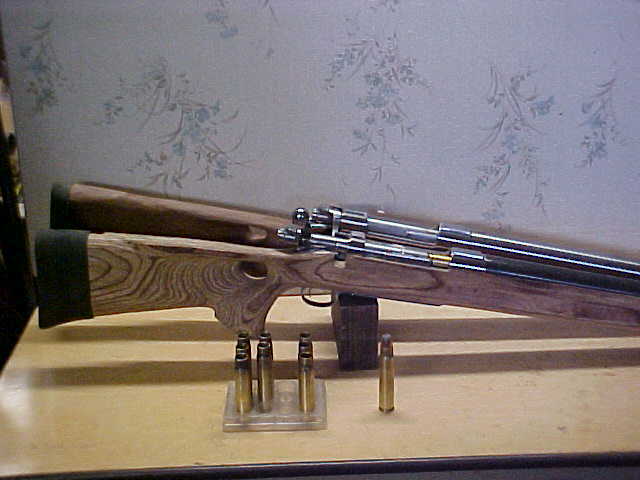 barrel.If I find one I can afford(pricey) I'll do 8ga. of the action setup Colin put the 2bore in. Here is picture of the 4bore in a more finished look.